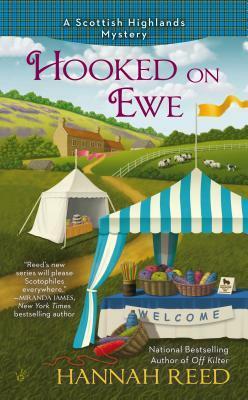 Author Eden Elliott is settling in on her Scottish adventure. She is helping her friend Vicki with her yarn club and she is also volunteering at the local fundraiser to benefit a hospice facility. She is totally surprised when Inspector Jamieson asks her to become a special constable. Sure she helped solve the murder of the sheep shearer that put Glenkillen “Off Kilter ” but that type of thing doesn’t happen too often around here. But before her warrant card even gets a crease the cantankerous head of the fundraiser welcoming committee is found strangled with some of her friend Vicki’s yarn. Well she is now authorized to snoop and snoop she does. Hannah Reed has penned quite an escape. I have never been anywhere near the Scottish Highlands but her words transport me there in an instant. Whether the sun is shining or storms are rumbling through I could “see and feel” exactly what Eden was, the descriptions are sensational. She has also created characters that are unique. Some are aggravating and others are endearing, and Eden does her best to be friendly with them all. She also uses a few of them for inspiration for her romance novels. Book 1 is complete and she starting to plan the 2nd as she is about halfway though her time in Scotland. The romantic relationship between Eden and a certain fishing guide is just starting to get interesting. I am excited to see how that develops. The mystery itself was very well plotted with some nice twists. It is nice to see the protag working in tandem with local law enforcement. Eden makes a much better constable that dear misguided Sean. You can tell the author has done her research to bring this story to life. I was totally captivating from the moment I started to the last word. Time to look for #1 in this series. I would love to read this Book. You have an interesting title and background in this one. I love it when you can tell the author has done her research! Thanks for sharing! Hey, if it’s Scotland, I’m there! I read the first book in the series and really enjoyed it. I’d love to have this book to add to my home library. I think I can catch up on this series, LOL, this sounds great, I have to go look for the first book. This sounds like fun! I hadn’t encountered the series before. I love Scotland, especially the Highlands, so I definitely need to check this book out! I haven’t been to Scotland since I was in my teens (my dad was born there). Would love to visit Scotland – this book sounds great! Visiting Scotland is on my bucket list. This book may be the closest I come! LOL Sounds super fun.